Since this is a Sony SW7600GR antenna question I thought I’d add another. I love the receiver but have trouble with LW and MW using any external antenna. I’ve noticed that when you cross the threshold between 1711 to 1710 khz the external antenna seems to be ignored and 1710 khz down to 150 khz only uses the internal ferrite antenna. I’m not sure what happens with an external in that frequency range on the Sony – but, all an external seems to do in that range is null out the signal and add MW overloading down in the LW frequencies. If I unplug the external and go outside to reduce the noise I can hear beacons in LW using just the internal ferrite. Seems other portable shortwaves don’t have this issue with random wires from what I’ve seen on YouTube. Anyone have some thoughts on this? Am I stuck with using the ferrite with a passive loop to improve the Sony on LW and MW? Yes, it does push voltage out if you use any external with a plug. I was also initially concerned with the same question (and also if it affected the antenna impedance) for the SW76000GR and purchased a blocking capacitor adapter (https://www.amazon.com/gp/product/B0006PIR8G/) between the ext jack and the antenna and found that it made absolutely no difference with dipoles, random wires, etc. (don’t have a loop). I did measure the voltage with the blocking cap in and yes it did block. But, you shouldn’t have any issue. Thank you Thomas for posting my inquiry and thanks to all who replied. Guy Atkins reminded me to dig deeper as I was familiar with Stephan Grosklas’ site, I simply had not dug any deeper than the 7600GR entry. Thanks again to all! Off topic. I wish someone could tell me how to stop the alarm from going off each day. I have read the instructions but they make no sense to me. Thanks. Permanent — If STANDBY A is showing in the display. Turn the radio off, leave the HOLD with off, no key showing in the display. With the radio off press and hold down the STANDBY MEMORY button A until STANDBY A disappears from the display. Release the button and do a quick press and release of the same button. When STANDBY A disappears you have 1 second to do the release, press, release. If STANDBY B is showing in the display. Turn the radio off, leave the HOLD with off, no key showing in the display. With the radio off press and hold down the STANDBY MEMORY button B until STANDBY B disappears from the display. Release the button and do a quick press and release of the same button. When STANDBY B disappears you have 1 second to do the release, press, release. Repeat until neither STANDBY A or STANDBY B show up in the LCD display. Somebody correct me if I’m wrong. I have one of these and I like it a lot, but I dropped it and it landed on the BFO control. I’d like to replace the pot. Does anyone have the schematic or parts list? It would be helpful to know the value of the pot and if there is a suggested replacement part. The ext. antenna socket is “hot”, i.e. powered through a 470 ohm resistence + 100 uH coil. This means that it will deliver approx. 10 mA DC current to the external antenna circuit. The coil is to prevent “polluting” the power circuit of the radio with radio frequency signal. Evidently, the purpose of this arrangement is to “inform” the accessory antenna when the radio is turned on. In case of the Sony AN-LP1 it turns on the antenna without need to use the antenna power switch. However, the 7600G will NOT power the antenna, the 10 mA are not enough to power the amplifier circuit. The power for the AN-LP1 comes from its own batteries. You can use this feature with any active antenna by including a proper power-up circuit – a nice feature if your active antenna is located far away from the radio and you want it to turn on and off automatically when you use your radio. You can connect any other antenna (provided it is correctly designed and installed) to the EXT ANT socket without risking to damage the radio. However, if the external antenna circuit has low DC resistence, it will drain some current from the radio. Therefore, you will experiment slightly higher power consumption from your batteries (up to 10% at normal listening volume). You can avoid this current drain by including a small ceramic capacitor (1000 pF) in series with the antenna circuit, however I don’t think it is really necessary. The 7600G has some basic protection build into the EXT ANT input circuit. Any static buid-up will be drained off via the power circuit mentioned in point 1. It also includes a diode pair (1SS123) to protect the input RF amplifier FET from damage due to too strong signals or an accidental connection of the antenna to a low voltage AC source. 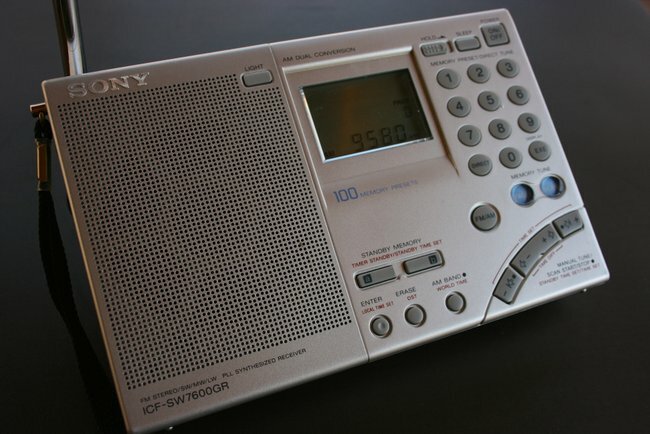 IT IS NOT A SUBSTITUTE FOR A PROPER ANTENNA GROUNDING AND LIGHTNING PROTECTION IF YOU USE AN EXTERNAL ANTENNA – YOU STILL NEED TO PROPERLY GROUND YOUR EXTERNAL ANTENNA AND PROTECT YOUR RADIO, but it builds some margin of safety to protect the front-end FET – a common problem with the Sony 2001D (2010). I can’t see any reason you can’t connect a longwire to the central post and plug it into the antenna jack of the receiver. Just ensure that you don’t short out the plug when soldering the wire as that may short the radio batteries and drain them rapidly. Having a small DC potential on the antenna won’t affect the antennas performance. Hi, a good antenna but very expensive in comparison to the materials of manufacture that are of the most basic a lot of plastic and little electronic, by the way, it is almost worth more the antenna than the radio.